The former Featherstone boss arrives at LSV two days after the Rovers stated their intention to take legal action against Derek Beaumont’s club for their approach to Duffy. But the 38-year-old joins Leigh with Paul Anderson continuing his role as assistant coach while Micky Higham will stay on as a player combined with the role of conditioner. A statement from Leigh read: “Leigh Centurions are aware of a press release published by Featherstone Rovers and can confirm that the Club is taking legal advice in respect of the release. “In light of the pending advice, the club does not believe that it is appropriate to provide a substantive response apart from putting on record that it requested, on several occasions, the alleged contract between Featherstone and John Duffy. Despite these numerous requests, this has not been provided. 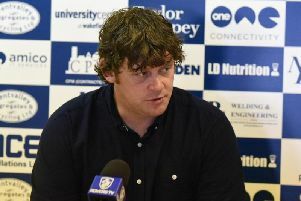 “At no time did John Duffy sign a further contract with Featherstone Rovers nor did he verbally agree to remain their coach beyond the 2018 season. Further, on 20 November 2018, Featherstone terminated the original contract with him. “Therefore, John Duffy is not contractually bound to Featherstone. And Duffy, who played 202 games for Leigh in three separate spells between 2001 and 2012 thanked his former employers for an “outstanding" experience at Post Office Road. He said: "I had a meeting with Ando and Micky and we are all in the same boat. Once you have played for Leigh it never leaves you. “I'd like to thank Mark Campbell, and his family in particular, for the way they looked after me. “We got a good squad together and, just like with Leigh, last year it was so tight, and we missed out on the four on the last day. “But we kept the group together, played with 14 men in one game and ended up with a Shield win. “So, I've got very fond memories of my time at Featherstone."